An update on the April 2014 American horseracing casualties. 80% of the vanned off were either later confirmed dead or have simply disappeared. Allowing that a few of the vanned may have been “retired”/rescued, I think it likely that some 90 horses from our April casualty lists are dead. But remember, that’s flat-track, in-competition only – this report does not include harness and training deaths. For context on the latter, though: Of the 98 on-track (or back in the barn) deaths in NY last year, 43% came in morning practice. If we were to add a similar percentage to the above, the toll grows dramatically. In addition, there were surely other euthanasias not reflected here – horses merely “pulled up” or “eased,” even some who per Equibase finished their races without incident. In short, I think it reasonable to assert that the New York Times figure – 24 dead horses a week – should be doubled, leaving us with well over 2,000 track-kills annually. And this says nothing of the thousands more sent to slaughter. All, for a 20th Century gambling game that can no longer compete on product alone. Please help end the madness: Stop betting on animal races. I only wish these figures were seen by more people as I live in hope that such dreadful and unnecessary loss might make some people think a little harder before they place a bet. Yeah, your right Gina. And here in Ontario, as you know – its dumping time – Fort Erie has finished shipping out disposals for 2014. It won’t be long now when stalls completely empty at Woodbine.So lots of tb here now will soon join homies at other (smaller purse) tracks for awhile….. Mountaineer, Charlestown, Penn, Thistle, Parx, Finger Lakes etc…A few horses will see Gulfstream and Tampa or train at Classic Mile etc..
Cths year end mixed sale nov29th….I always feel so sorry for the older broodmares…. I feel so sorry for the Broodmares as well. First off, they NEVER had a choice to be pregnant. That was forced upon them. Many end up in horrible situations and at Kill Auctions. It’s not only small farms that put them through the ring. Some of the richest and most prominent Owners dump BM’s at auctions while their cleaning out stock for the “new improved” stock. When are the Ontario Taxpayers going to say ENOUGH! If you want horse racing – you pay for it. These CEO’s made 345 MILLIONPER YEAR for 12 years and NEVER put money aside for a rainy day?? Never generated a self-sufficient business independent of the Ontario Government cash cow? I don’t know of any other business in this province that gets preferential treatment while taxpayers money disappears and the top Owner/Trainer at Woidbine is AMERICAN who has never contributed to Ontario Taxes long before the casino came in. They were nowhere to be found when struggling Ontario Trainers made a living off of $5000 purses only to have their stalls taken away when the purse money went through the roof. Even the VP of Woodbine Racing is American (he’s now a Dual citizen), but never paid taxes in Ontario. Before you accuse me of being anti-AMERICAN – I’m not, BUT the point is they literally stole our purse money supported by Ontario Taxpayer money while denying stalls to Ontario Trainers????? Do you think this would EVER go over in the U.S?? NO WAY! The HBPA was nowhere to be found while this was going on. I’m so thankful that I’ve never bet on horse races, however, after reading about the way the horses are treated and the number of deaths I would no longer do any betting, had I ever started. I guess I just don’t understand why/how these owners and trainers can make this a daily occurance, and not be held accountable for their actions. In reading through this long list of horses, I am again reminded of the horrific end met by so many racehorses in order for fans to be entertained and connections to line their pockets. The name of the three-year-old filly Champagne Sipper caught my eye when reading through this list, so I looked her up. Her race at Lone Star on April 4 was her first race…she was “reluctant to load” (but was forced to anyway), “was urged along” (urged with a whip, I’m certain), “failed to respond” (to the whip), and finally, was “pulled [up] in distress after the race and was vanned off”. In distress. She was THREE. She made $100 in that race, her first. Those of you who so proudly declare your support of this gambling industry that does THIS to immature equines like Champagne Sipper, remind us why you support it. Entertaining, was it? Worth the one-hundred-bucks, was it? And was it great “fun” (since racehorses LOVE to run) for the little filly who didn’t want to load, suffered the pain of the whip, and was in distress after only six furlongs? Just what was it about making Champagne Sipper race that benefited HER? I’m certain that once again, no racing supporter will answer that question. 95 horses vanned off in one month ! And of the 73 “missing” horses I wonder how many were sold to the kill buyers ? And as we know, these numbers are not accurate because many casualties go unreported. I would like to see the supporters of racing rationalize this outrage. 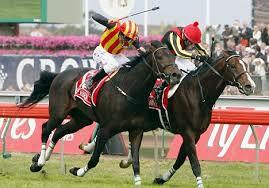 This “sport” needs to go because, by it’s very nature, it can never be other than what it is, outright horse abuse ! !